Revolutionary CX Compression and Expansions System will change the way you pack. Briggs & Riley® patented CX™ Expansions Compression Technology expands your suitcase up to 34 %, then compresses your suitcase back down to the original size - no sitting on your suitcase required. 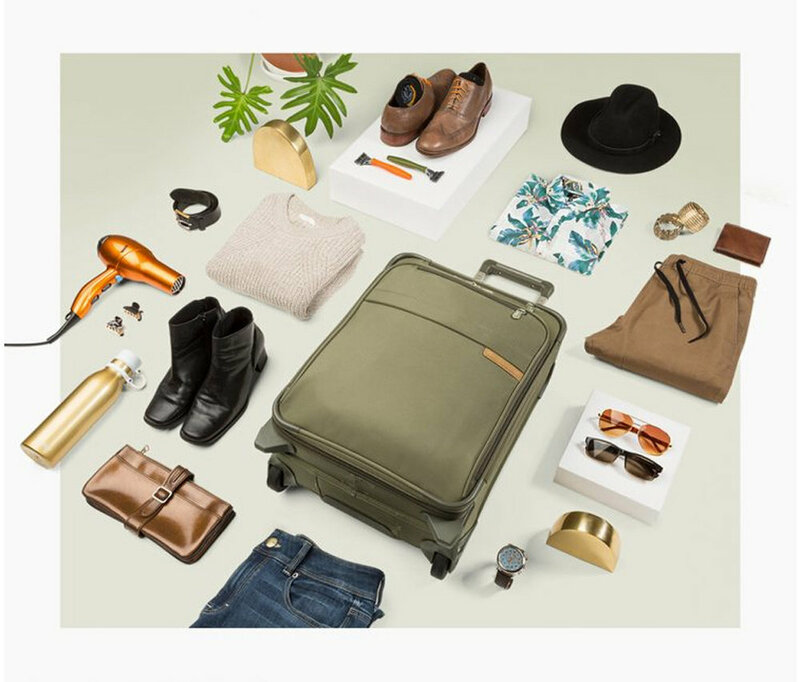 Increase your packing capacity, so you can bring back souvenirs from your vacation, or pack an extra outfit just in case. Shop Briggs & Riley Suitcases with CX Tech. Here is how Briggs & Riley® CX™ Expansions Compression Packing System works. Before packing, easily expand the sides of the suitcase. Pack your clothing and travel items in the suitcase as normal. Zip your suitcase closed. At this point, if you are packing a carry on suitcase, the bag is no longer a carry on size, but don't worry. Next activate the compression system on each side of the bag by simply pushing down on the top and bottom of your suitcase. The bag returns to its original size. Now your carry on suitcase is carry on compliant and can be stored in the overhead bin of the airline. Briggs & Riley® CX™ Compression-Expansion Technology is every traveler's secret (packing) weapon. Available in both hard and soft-sided Briggs & Riley® cases, this seamless expansion system allows you to pack to your heart's content by expanding your luggage, then compressing it back down to its original, carry-on size. Whether you prefer a timeless bag from the iconic Baseline Collection or an ultra durable hardside from Sympatico, CX™ Briggs & Riley® will have your back because let's face it, when it comes to packing, you can never have too much space. Watch the Briggs & Riley® video showing you how the CX Expansions Compression works. Briggs and Riley patented CX allows users to expand their bag up to 34%, then compress back to original size. So you can pack all your shoes. CX™ Compression-Expansion Technology might sound a little intimidating, but we can say with absolute certainty, it’s an easy-to-use, sophisticated feature that makes the road warrior life as easy as pack, compress and go. Whether you’re a fan of hard-sided luggage or soft—or both, because really, who can decide sometimes—there’s a Briggs & Riley CX™ bag perfect for you. So what exactly does CX™ do, you might be asking. Good question. CX™ Technology gives you the ability to jam-pack your bag with everything you need (and want, and then some). But thanks to the incredible patented compression-expansion system, not only can you expand your bag up to 34 percent, but then you can compress it back down to carry-on size. If you don’t like waiting in line at the luggage carousel after a long flight (because who does? ), no problem. An added bonus, especially for business travelers, is that you won’t have to check your CX™ bag if it’s the size of a carry-on. No matter how often you hit the road, saving time and money with this sort of convenience is something to cherish. What’s something else to cherish? Arriving in style. When designing CX™, we were determined to innovate more than just the packing process. It’s vital that upon arrival our bags still perform, and these ones definitely do. Our compression-expansion technology allows you to compress your belongings securely in place. So when you arrive and unpack, your clothes will be exactly as you packed them—wrinkle-free and ready-to-wear. No iron or steamer? No problem. Once you’ve packed everything you need for your travels, simply expand the CX™ mechanisms on the sides. Pull up each side of the case and then zip the case closed. Finally, compress the bag back down to its original size, and finito! You’re ready to go with your travel essentials packed in a sleek, sophisticated bag. When preparing to return home, use the exact same method, even if you’re now packing a few souvenirs. We hope you are, because these bags can certainly handle it. CX™ is the ultimate compression system. It’s the strong, yet lightweight innovation that gives you more options when it comes to traveling. Not only does CX™ give you the space to pack for any situation—whether it’s a last-minute weekend getaway or impromptu hiking excursion—but it also ensures that you’ll be prepared, organized and most of all, stylish upon arrival.